Hopia is one of the popular pastries here in the Philippines. But it isn’t a native one because this hopia was introduced to us Filipinos, by the Chinese. This pastry has two famous variations: the hopia munggo and the hopia baboy. So how do we classify them? It is through the filling. If the filling is made out of mung bean paste, then it is “hopia munggo” but if it is made out of candied winter melon, green onions and pork fat it is what we called the “hopia baboy”. Aside from these two there are also the Ube, Buko Pandan, Macapuno, Langka, and Queso versions. But the most popular among these is the Hopia Munggo. As mentioned previously, hopia munggo’s filling is made out of the mung bean paste. 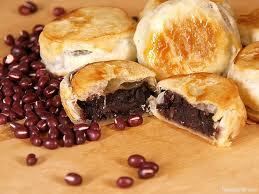 In this pastry, we don’t just use the mung bean paste, but also some ube paste, to yield that good taste. The totality of this pastry not only depends on the filling but also on the crust. Well, the crust is not that difficult to make since all the instructions given are simple. Also, the needed ingredients are not the hard to find, it’s all available in the supermarkets. The only thing that you have to take note of is the baking time. Be sure that you don’t exceed it, so the hopia munggo will came out good. For some nutritional facts, munggo or mung bean is of low cholesterol, it is good control for breast cancer, and also it has low sugar level. So if ever you are on a strict diet, this hopia mungo will surely be a good pick. So, get ready now to bake your own hopia munggo! Sift all purpose flour in a large mixing bowl; make a well in the center and add the water, sugar and corn syrup. Add pork lard and mix with wooden spoon just to incorporate ingredients with the flour. Do not overmix. Form dough into a ball, cover with cloth and set aside for 30 minutes. In a bowl, mix together 1 cup all-purpose flour and 1/2 cup pork lard until a homogenous paste is formed. On a lightly floured board or surface, roll out dough ball with a rolling pin to form a rectangular 1-inch thick. With a spatula, spread the paste evenly over the rectangular dough so that the paste covers two thirds of the surface of the rectangular. Fold the uncovered portion over the center and fold the remaining 1/3 over the first. Fold to make three layers of the dough with the paste in between each layer. Roll our folded dough to its original size and repeat folding process without the paste. Roll out the dough once more and fold for the third time. Allow to rest for 5 minutes. Roll out the dough to its original size. Cut sheet of dough lengthwise into two equal portions. roll each portion jelly roll fashion and cut into 12 equal pieces. Flatten each piece and roll out with rolling pin to form a circular piece. Put about a tablespoon of the munggo or ube-sugar filling at the center and bring up the sides to top center. Seal tightly. Press top lightly to flatten. Place filled pieces on ungreased baking sheetlined with brown paper. Brush top with egg or milk diluted with a little water. Prick surface with a little tines of fork to let out steam. Bake in a preheated oven at 400�F for 25-30 minutes or until slightly golden brown.